Stuart Alan Kauffman (born September 28, 1939) is an American theoretical biologist and complex systems researcher who studies the origin of life on Earth. In 1971, Kauffman proposed the self-organized emergence of collectively autocatalytic sets of polymers, specifically peptides, for the origin of molecular reproduction. Reproducing peptide, DNA, and RNA collectively autocatalytic sets have now been made experimentally. He is best known for arguing that the complexity of biological systems and organisms might result as much from self-organization and far-from-equilibrium dynamics as from Darwinian natural selection, as well as for applying models of Boolean networks to simplified genetic circuits. His hypotheses stating that cell types are attractors of such networks, and that genetic regulatory networks are “critical”, have found experimental support. Kauffman graduated from Dartmouth in 1960, was awarded the BA (Hons) by Oxford University (where he was a Marshall Scholar) in 1963, and completed a medical degree (M.D.) at the University of California, San Francisco in 1968. After completing his residency in Emergency Medicine, he moved into developmental genetics of the fruitfly, holding appointments first at the University of Chicago, then at the University of Pennsylvania from 1975 to 1995, where he rose to Professor of Biochemistry and Biophysics. Kauffman held a MacArthur Fellowship, 1987–1992. Kauffman rose to prominence through his association with the Santa Fe Institute (a non-profit research institute dedicated to the study of complex systems), where he was faculty in residence from 1986 to 1997, and through his work on models in various areas of biology. These included autocatalytic sets in origin of life research, gene regulatory networks in developmental biology, and fitness landscapes in evolutionary biology. Kauffman holds the founding broad biotechnology patents in combinatorial chemistry and applied molecular evolution. He has made everything beautiful in its time. He also has planted eternity in men’s hearts and minds [a divinely implanted sense of a purpose working through the ages which nothing under the sun but God alone can satisfy], yet so that men cannot find out what God has done from the beginning to the end. Skeptics discount this but yet Kauffman realizes that many out there experience these feelings that tell them that God exists and that God wants to have a relationship with them. HOWEVER, THERE IS NO BASIS FOR HOPE FOR THE SECULAR HUMANIST THAT DOESN’T BELIEVE IN AN AFTERLIFE. NEVERTHELESS KAUFFMAN USES TERMS SUCH AS VALUES AND SPIRITUAL SPACE EVEN THOUGH HE HAS NO BASIS FOR THOSE THINGS IN A SECULAR WORLDVIEW. Now you have now the birth of Julian Huxley’s evolutionary optimistic humanism already stated by Darwin. Darwin now has a theory that man is going to be better. If you had lived at 1860 or 1890 and you said to Darwin, “By 1970 will man be better?” He certainly would have the hope that man would be better as Julian Huxley does today. Of course, I wonder what he would say if he lived in our day and saw what has been made of his own views in the direction of (the mass murder) Richard Speck (and deterministic thinking of today’s philosophers). I wonder what he would say. So you have the factor, already the dilemma in Darwin that I pointed out in Julian Huxley and that is evolutionary optimistic humanism rests always on tomorrow. You never have an argument from the present or the past for evolutionary optimistic humanism. You can have evolutionary nihilism on the basis of the present and the past. Every time you have someone bringing in evolutionary optimistic humanism it is always based on what is going to be produced tomorrow. When is it coming? The years pass and is it coming? Arthur Koestler doesn’t think it is coming. He sees lots of problems here and puts forth for another solution. You think of the Swedish Opera (ANIARA) that is pictured inside a spaceship. There was a group of men and women going into outer space and they had come to another planet and the singing inside the spaceship was normal opera music. Suddenly there was a big explosion and the world had blown up and these were the last people left, the only conscious people left, and the last scene is the spaceship is off course and it will never land, but will just sail out into outer space. They say when it was shown in Stockholm the first time, the tough Swedes with all their modern mannishness, came out (after the opera was over) with hardly a word said, just complete silence. You find all he is left here is biological continuity, and thus his feeling as well as his reason now is against his own theory, yet he holds it against the conclusions of his reason. Reason doesn’t make it hard to be a Christian. Darwin shows us the other way. He is holding his position against his reason. I just don’t see how any secular humanist can be optimistic and avoid Professor Levy’s nihilism. First, let me tell you what prompted me to do this post today. There are 3 videos in this series and they have statements by 150 academics and scientists and I hope to respond to all of them. In this third video below the 134th clip is of the Dr. Stuart Kauffman and it is there that I got the quote I highlighted above and I respond to it. I grew up at Bellevue Baptist Church under the leadership of our pastor Adrian Rogers and I read many books by the Evangelical Philosopher Francis Schaeffer and have had the opportunity to contact many of the evolutionists or humanistic academics that they have mentioned in their works. Many of these scholars have taken the time to respond back to me in the last 20 years and some of the names included are Ernest Mayr (1904-2005), George Wald (1906-1997), Carl Sagan (1934-1996), Robert Shapiro (1935-2011), Nicolaas Bloembergen (1920-), Brian Charlesworth (1945-), Francisco J. Ayala (1934-) Elliott Sober (1948-), Kevin Padian (1951-), Matt Cartmill (1943-) , Milton Fingerman (1928-), John J. Shea (1969-), , Michael A. Crawford (1938-), Paul Kurtz (1925-2012), Sol Gordon (1923-2008), Albert Ellis (1913-2007), Barbara Marie Tabler (1915-1996), Renate Vambery (1916-2005), Archie J. Bahm (1907-1996), Aron S “Gil” Martin ( 1910-1997), Matthew I. Spetter (1921-2012), H. J. Eysenck (1916-1997), Robert L. Erdmann (1929-2006), Mary Morain (1911-1999), Lloyd Morain (1917-2010), Warren Allen Smith (1921-), Bette Chambers (1930-), Gordon Stein (1941-1996) , Milton Friedman (1912-2006), John Hospers (1918-2011), Michael Martin (1932-).Harry Kroto (1939-), Marty E. Martin (1928-), Richard Rubenstein (1924-), James Terry McCollum (1936-), Edward O. WIlson (1929-), Lewis Wolpert (1929), Gerald Holton (1922-), and Ray T. Cragun (1976-). Today I will answer the simple question: IS IT POSSIBLE TO BE AN OPTIMISTIC SECULAR HUMANIST THAT DOES NOT BELIEVE IN GOD OR AN AFTERLIFE? Woody Allen’s Professor Levy represents the best of secular philosophy, but still is lacking in the end and Levy jumps out the window to end his life!!! Let’s look at some of his thought processes. Two worldviews are presented by Woody Allen in this film CRIMES AND MISDEMEANORS and the first one is my view and that is the view that God exists and created the world with a moral structure for a purpose and the other one is there is no reason why things happen and there will be is no God there and the Hitlers of the world will never be punished. Francis Schaeffer has written extensively on art and culture spanning the last 2000years and here are some posts I have done on this subject before : Francis Schaeffer’s “How should we then live?” Video and outline of episode 10 “Final Choices” , episode 9 “The Age of Personal Peace and Affluence”, episode 8 “The Age of Fragmentation”, episode 7 “The Age of Non-Reason” , episode 6 “The Scientific Age” , episode 5 “The Revolutionary Age” , episode 4 “The Reformation”, episode 3 “The Renaissance”, episode 2 “The Middle Ages,”, and episode 1 “The Roman Age,” . My favorite episodes are number 7 and 8 since they deal with modern art and culture primarily. (Joe Carter rightly noted, “Schaeffer—who always claimed to be an evangelist and not aphilosopher—was often criticized for the way his work oversimplifiedintellectual history and philosophy.” To those critics I say take a chill pillbecause Schaeffer was introducing millions into the fields of art andculture!!!! !!! More people need to read his works and blog about thembecause they show how people’s worldviews affect their lives! There is evidence that points to the fact that the Bible is historically true asSchaeffer pointed out in episode 5 of WHATEVER HAPPENED TO THE HUMAN RACE? There is a basis then for faith in Christ alone for our eternal hope. This linkshows how to do that. Many modern artists are left in this point of desperation that Schaeffer points out and it reminds me of the despair that Solomon speaks of in Ecclesiastes. Christian scholar Ravi Zacharias has noted, “The key to understanding the Book of Ecclesiastes is the term ‘under the sun.’ What that literally means is you lock God out of a closed system, and you are left with only this world of time plus chanceplus matter.” THIS IS EXACT POINT SCHAEFFER SAYS SECULAR ARTISTSARE PAINTING FROM TODAY BECAUSE THEY BELIEVED ARE A RESULTOF MINDLESS CHANCE. 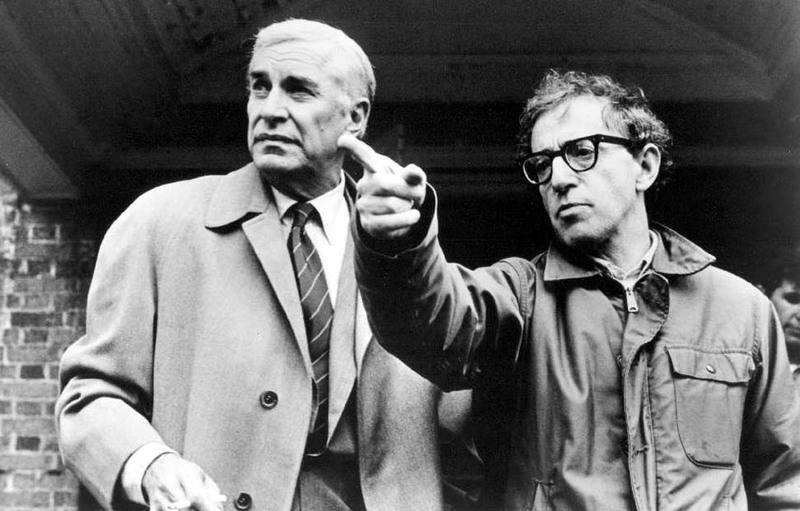 A discussion of Woody Allen’s 1989 movie, Crimes and Misdemeanors, perhaps his finest. Is a optimistic humanism possible? Here below is the song DUST IN THE WIND performed by the rock group KANSAS and was written by Kerry Ligren in 1978. I challenge anyone to read these words of that song given below and refute the idea that accepting naturalistic evolution with the exclusion of God must lead to the nihilistic message of the song! Music video by Kansas performing Dust In The Wind. (c) 2004 Sony Music Entertainment Inc. The vast majority of people believe there is a design or force in the universe; that it works outside the ordinary mechanics of cause and effect; that it is somehow responsible for both the visible and the moral order of the world. Modern biology has undermined this assumption…But beginning with Darwin, biology has undermined that tradition. Darwin in effect asserted that all living organisms had been created by a combination of chance and necessity–natural selection… First, God has no role in the physical world…Second, except for the laws of probability and cause and effect, there is no organizing principle in the world, and no purpose. (William B. Provine, “The End of Ethics?” in HARD CHOICES ( a magazine companion to the television series HARD CHOICES, Seattle: KCTS-TV, channel 9, University of Washington, 1980, pp. 2-3). The British humanist H. J. Blackham (1903-2009) put it very plainly: “On humanist assumptions, life leads to nothing, and every pretense that it does not is a deceit. If there is a bridge over a gorge which spans only half the distance and ends in mid-air, and if the bridge is crowded with human beings pressing on, one after the other they fall into the abyss. The bridge leads nowhere, and those who are pressing forward to cross it are going nowhere….It does not matter where they think they are going, what preparations for the journey they may have made, how much they may be enjoying it all. The objection merely points out objectively that such a situation is a model of futility“( H. J. Blackham, et al., Objections to Humanism (Riverside, Connecticut: Greenwood Press, 1967). I think you may be quoting Blackham out of context because I’ve heard Blackham speak, and read much of what he said, but Blackham has argued continuously that life is full of meaning; that there are points. The fact that one doesn’t believe in God does not deaden the appetite or the lust for living. On the contrary; great artists and scientists and poets and writers have affirmed the opposite. Nihilism has two traditional enemies–Theism and Naive Humanism. The theist contradicts the nihilist because the existence of God guarantees that ultimate meaning and significance of personal life and history. Naive Humanism is considered naive by the nihilist because it rhapsodizes–with no rational foundation–the dignity and significance of human life. The humanist declares that man is a cosmic accident whose origin was fortuitous and entrenched in meaningless insignificance. Yet in between the humanist mindlessly crusades for, defends, and celebrates the chimera of human dignity…Herein is the dilemma: Nihilism declares that nothing really matters ultimately…In my judgment, no philosophical treatise has ever surpassed or equaled the penetrating analysis of the ultimate question of meaning versus vanity that is found in the Book of Ecclesiastes.